Uiagelelei Rates Oregon Visit 'A 10' Five-star DJ Uiagelelei got the 'five star treatment' in Eugene. Was it enough to put the Ducks in line for a commitment? 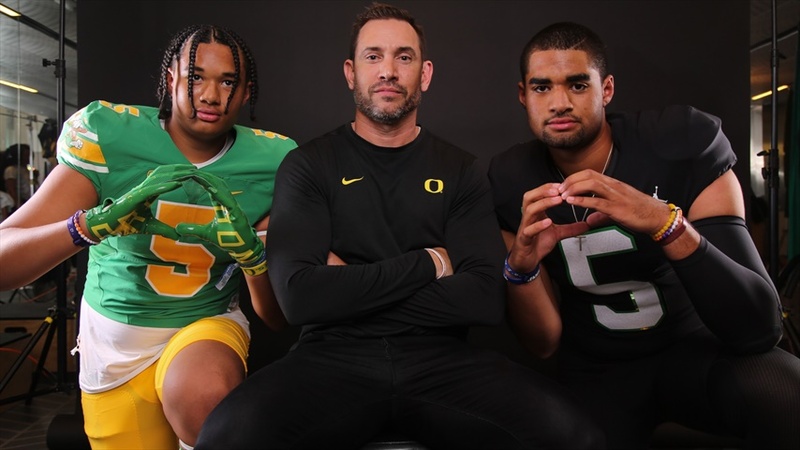 How many commits will Oregon get this weekend? What makes new Oregon commit Kris Hutson a big pickup for the Ducks? Well he's more than just speed. The Ducks have landed a huge commitment from four-star wide receiver Kris Hutson. Who from the massive visitor list could be committing to Oregon this weekend? Here are my predictions and some more JUICE. Four-star linebacker Jaden Navarrette talks about his decision to commit to Oregon on Friday. Oregon has picked up a commitment from four-star defensive end Jaden Navarrette. Four-star quarterback Jay Butterfield recaps his mid-week visit to Oregon and what's next on his agenda.